This sort of work really shifts us into the realm of Interdisciplinary Practice – I believe this sort of investigation should be a part of Drama Education – although I’m still finding a lot of other Drama teachers who don’t seem to want their paradigm to develop. Interdisciplinarity, Theatricality and Performance Studies are yet to have much impact on school based drama programs (K-12), or so my recent experiences suggest. Second Life® main grid is not open to minors – you must be 18+ to participate in the main grid of Second Life. Teen Second Life® on the other hand is designed for teens – to be there as an adult you need to subject yourself to the usual range of background checks and police clearances. It’s my belief that online engagement has a lot to offer students at all levels – but also let me be clear that I am not talking about the wholesale abandonment of what we currently do in Drama Education. I see a lot of drivel served up in schools under the banner of Drama. I like to remind the masses that a highly polished stage production doesn’t indicate a healthy or meaningful drama department behind it. The measure comes in the form of pedagogy, scope of learning, connection to other subjects and relevance to the lives of learners. identify/create a platform, articulate its poetics and discover how it will manage ever changing content. I am quite sure that many students will find online worlds like Second Life very engaging â€“ but Second Life just happens to be the big commercial favourite of the moment – there are other options with 3D MUVEs (Multi User Virtual Environments) – Active Worlds, Blink 3D, Entropia Universe, There, Multiverse and Metaverse are just some of the other choices available to you. Some are open-source and allow you to modify every aspect of the installation, others are commercial products with varying degrees of control and customisation possible. There are cost considerations with all of these options and to run full classes in something like Second Life you need to have inworld land or access to inworld land. You can buy an island and develop your own sim, or you can rent, or if you spend enough time in a community you can start to forge relationships that might allow you to collaborate with people/organisations who have land. 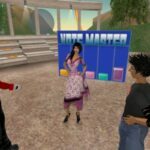 The idea you mention about the projection and engaging in a mixed reality drama is similar to my proposed final development phase – however there is a lot more to it than simply projecting inworld activity – for instance, how will you feedback the other way? 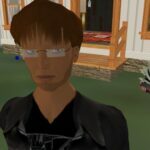 There is a huge level of research and development going on and projects like the one Jeremy Turner is promoting are just a small part of the totality of inworld activity – have a look at what Second Front and Wirxli FlimFlam have been upto in recent times – http://www.slfront.blogspot.com/ . This all a part of the rich tapestry that is Drama – but I doubt it is included even as a discussion point in many Drama classrooms where there are too many too busy doing Space Jump. Managing online behaviour is not often a simple matter and with all the emotional paranoia surrounding technology use these days you’ll find you have more than a few administrative concerns to deal with.Â= That doesn’t mean abandon the idea – it simply means be aware that you will be seen as a pathfinder – you will complicate matters for the mainstream: an emotional readiness for the challenges that can raise is important. Yes, I’m becoming a bit jaded about where Drama Education is heading and sometimes my cynicism slips through, but I do live in hope! New Media technology impacts on every aspect of our existence but in Drama too many seem to be working as though MySpace, YouTube, Google and WIkipedia are not significant components of students lives. The most exciting dynamic theatre practitioners in the world are aware of the changes that are afoot and the work they produce is not simply a pale imitation of corporatised and franchised theatre production – they push the limits, the define new practices, and they grow. Student disengagement in Drama classes can stem from a range sources – they can feel insecure about their involvement in drama – overcoming fear is often tougher than dealing with disciplinary actions – students can be struggling to find relevance in the work offered – students can feel disempowered and hence disinterested when teachers do not allow accommodate critical pedagogy – students can feel empowered to resist – students can feel lost – students can be arbitrarily forced beyond their limits, or equally restrained in their creativity, by programs and approaches that don’t allow for individuated pathways; technology can address some of these issues when both the technology and the issue are understood – technology breeds new cultures and new cultural understandings are necessary – not the least of which is knowing and understanding how students currently perceive and engage with the use of technology. I’m happy to develop discussion and assist with project design at any stage (although in a few months when I’m in the thick of writing and shaping my thesis I might think differently) there is so much going on in the realm of New Media. New media and technology forms allow drama and performance to translate across the liminal interface of computer screen. Drama practitioners and contemporary performance artists push the boundaries of our perceptions of traditional theatre and Drama. This workshop will take participants into two virtual worlds – one a text based MOO and the other the persistent 3D world of Second Life. Participants will engage in some introductory online role-play and consider how they might shape and develop similar interactions for their students. Alternative environments will also be demonstrated. The title reflects the shift that is occurring – the use of unfamiliar linguistic codes that are used by elite coders, game players, and even SMS and online messenger services can alienate those of us more attuned to Standard Australian English. These codes are designed precisely to exclude and include. This is my original title – it is obtuse, it is unclear, it is exclusionary – precisely the aspects we need to recognise – we don’t automatically belong to this emerging technologised society – we are the newcomers, the immigrants and in many ways our students will be guiding us through the codes and meanings -however at some point we need to take stock and take charge of our role in this new arena. This proposes an alternative concept for thinking about engagement in online environments as a form of “generative play”. The notion of “generative play” draws on existing forms of online roleplay (MMORPG, Alternate Reality Games and persistent virtual worlds) and combines it with principles of process drama. The result is an emergent modality that reveals itself as a playful engagement that expects significant meaning-making without predetermined or prescribed content. Using this model as a frame we can consider new approaches to creating educational drama forms which can comfortably draw together varying degrees of online and offline engagement. The frame of “generative play” can also accommodate the development of new performance paradigms that launch us into the world of networked performance. This workshop will guide participants through the development of a functional Alternate Reality Game as a site for enacted Process Drama. Participants will be guided through the process of designing and creating an ARG that draws upon the established principles of Process Drama and the emergent forms of cross-media entertainment. Participants should be able to readily translate the experience into their own contexts to create new and exciting games-inspired performance modalities that maintain a strong educational bedrock. RSS journals – using blogs and wikis as alternatives to journals. This session aims to explore the uses of simple online Web 2.0 technologies as tools in streamlining and enlivening the experience of journaling, reflexive writing and note-keeping. The collaborative and “hive” mindset of such spaces as blogs and wiki allow for a comprehensive approach to individual and group writing, as well as a quick and easy package that can be framed as a digital portfolio. Creative teachers can also conceive of these spaces as performative sites. This session could extend to include podcasting, vodcasting and machinima. Second Life as a solution to theatrical design tasks. The design and building tools of Second Life (and similar technologies) can be seen as a very effective and engaging way of undertaking design tasks in the theatre. Costumes, sets, props and scenery can all be developed within the 3D environment and presented very effectively as walk through models. Costumes can be shown moving on avatar bodies and directors can work with avatars in virtual representations of real theatre spaces to enhance visual codes and blocking plans. Many dynamic groups of educators around the globe use the tools of mailing lists, blogging and instant messages as drivers to keep their communities dynamic and thriving. In our region, the groups DramaQueensland (Aust) and DramaNet (NZ) serve as wonderful examples of how drama educators work to build and enhance the value of their own professional communities. On a broader plane there are thousands of effective groups that operate. Effective and dynamic listservs allow subscribers to instantly put out a call for assistance, share resources, mentor and comment on issues.Â The technologies are effectively self-sustaining and do not need very much maintenance these days, and for such little effort the payoff can be immense in terms of professional support and collegiality. We are all busy and yet we could so easily be helping ourselves through listservs, blogs and RSS feeds for a start..